Embroidery. Yes, everything except that lovely pink background is done with thread. THREAD. 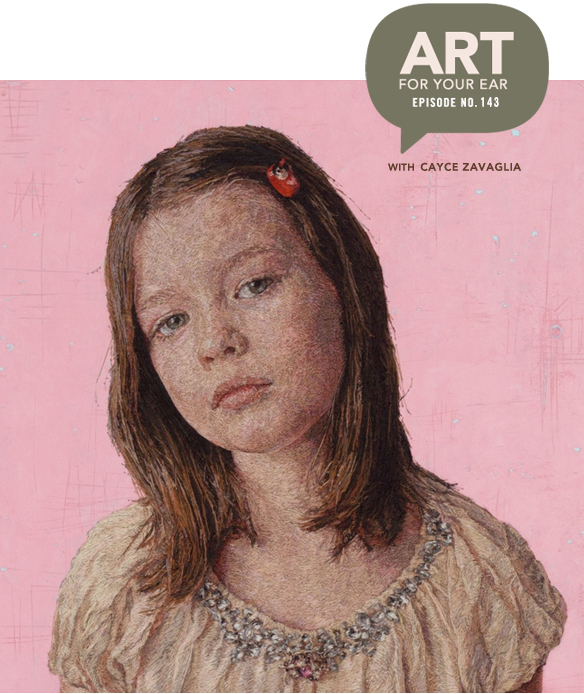 Cayce Zavaglia is an American painter who now uses stitches instead of brushstrokes – although, paint has recently come back into her arsenal. In reverse. Huh? Well just listen right up there under “Florence”, or subscribe on iTunes, and it will all make sense very soon. Yeah, thread. Teeny tiny perfect little stitches, all coming together to create absolutely stunning portraits of Cayce’s friends and family. I mean, WHAT!? Messy but beautiful… just like life. Love! And there she is in action. Seriously, I could NOT do what Cayce does. Thank goodness for that little ball she squeezes while stuck in traffic so that her hands stay strong! Thanks so much to Cayce for doing this with me; thanks to Saatchi Art and Thrive for supporting the episode; and BIG thanks to you for listening. There will be more art for your ear next weekend. Beautifully sensitive work and it was a delight to hear Cayce’s story! Cayce, You are tapped into some kind of a secret club, only you and the gods know about. So fantastic! Brilliant work Cayce! And I love the fact that you turn the work around for a totally different view. Exactly what I would have done! Gorgeous artwork and fabulous conversation! As a mother to be, I love hearing from parents who thrive on making great art. I have to add that if you both love The Great British Bake Off, you MUST watch The Great Pottery Throw Down. It’s produced in the same style and is entirely focused on ceramics and passion for pottery.. I binge watched both seasons online in a fortnight. Such delightful jerk-free entertainment. what!? that sounds AH-MAZING!!!! thanks bec! Also, don’t forget the Great Canadian Bake Off!! Just as charming, and exactly the same format. But I wanted to say about your arthritis….get checked for Rheumatoid Arthritis if you are having trouble (you can look up symptoms online) because early, aggressive treatment for this disease (which I have) can stop you from ‘losing’ your hands (not actually losing them, but losing from a working perspective). As an artist yourself, such critical tools!! I loved the interview (as I have all of them), the podcast is so inspiring. Thanks for it and all you do.